At Symmetry Counseling, we are proud of our staff of highly trained and experienced licensed mental health professionals. 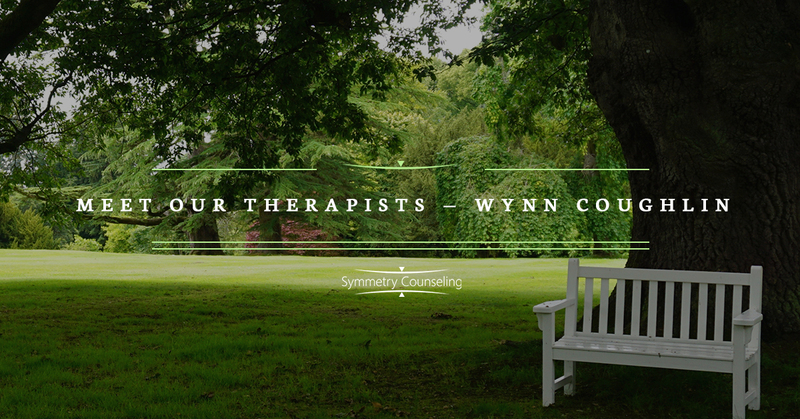 In the above video, meet Wynn Coughlin, a Licensed Clinical Social Worker here at Symmetry Counseling. I kind of had the idea that I wanted to be a therapist when I was fairly young. I had a lot of experience with therapy myself early on. Then I fought that calling for several years and tried to explore other things, which was helpful but I think at a certain point it just hit me that I couldn’t picture myself doing anything else, and ended up pursuing a master’s in social work. From there, it’s pretty much been a consistent journey. In terms of specialties, I work with a lot of folks struggling with substance abuse, addiction, trauma, a lot of attachment trauma, which is trauma that occurs over a prolonged period of time, usually perpetrated by a caregiver like a parent or grandparent. And a lot of eating disorders and disordered eating in general. Really broadly, I love working with people who struggle with self-destructive behavior. It’s not only some of the most rewarding work, it’s also some of the most interesting conversations and deep-diving into why, as human beings, we don’t always do things that rationally make sense. While in session, I pick strategies and pick techniques from dialectical behavioral therapy, a little bit of CBT, a lot of motivational interviewing and some narrative work. I use some art therapy in session. I do a lot of eye movement and desensitization reprocessing, which is EMDR and is an amazing technique that has been incredibly helpful for a lot of my clients in a lot of different areas. Really broadly and fundamentally though, I believe that the brain and the body want to heal themselves. They have a natural tendency, and as human beings, we have a natural tendency, towards growth and maturity and wisdom and healing and all of that good stuff. And that there are obstacles to that happening, which is really where trauma comes into play. So my goal as a therapist is to help, as much as we can, to remove some of the obstacles that get in the way of your natural tendency towards healing and towards growth. I live for that moment when things click. That moment when I can see it in somebody that what was really vague and unclear and funky all of a sudden becomes a goal that is doable and attainable. Watching people grow is really a privilege. If I’m being honest with myself, I’m a cat. I love naps, I love being cozy, usually takes a little while for people in my personal life to really get beneath the walls but you know, once I’m in, I’m in. In terms of self-care, I love exploring new parts of the city. I love anything in nature; I love being around plants and trees and water is good for me. I also am a big fan, when I get stressed, of cleaning something. Usually it’s my kitchen or my bathroom or my floors, but cleaning is good for the soul. I love reading. I love going to conservatories, botanical gardens, things like that. I love going to new restaurants. I have dabbled in writing fiction, nonfiction, poetry. I love going to museums. I can tell I am getting older because I have become an early bird in the last two years. I used to be able to stay up forever and now I turn into a pumpkin at 9 o’clock. So definitely more of an early bird lately. Lately, it has become a quote by a French philosopher named Jean-Paul Sartre. I discovered it in the EMDR book, the basic text of that. He says, “Freedom is what you do with what’s been done to you.” Therapy is hard, life is hard, there is a lot of work involved in it, and the point, at least from my perspective, is freedom. Is to be free from what has happened. And that puts it all into perspective.